A powerful, politically minded and acerbic Nobel Laureate, Britain’s Doris Lessing was a treasured social commentator and novelist who continued her prolific and award-winning career into her 80s. 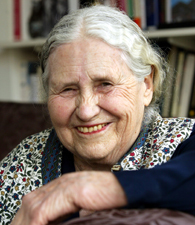 Doris Lessing was born Doris May Tayler in what is now Iran on October 22, 1919, to British parents. The family moved to modern-day Zimbabwe when Lessing was four to become farmers, though they struggled once there. Lessing clashed with her mother, and left home when she was 15. She worked as a nursemaid while writing stories, and sold two to magazines. In 1937, she moved to Salisbury. She married at 19, but later left her husband and young children. After joining a Communist group, she met and married Gottfried Lessing. According to The New York Times, Gottfried was a German communist, and the marriage was “her ‘revolutionary duty’ to protect him in a wartime environment hostile to Germans.” Though they planned to—and did—divorce after the war, they had a son together. After divorcing Lessing, Doris took her son and moved to London. Her first novel, “The Grass Is Singing,” was published in 1950 and was later adapted into a movie. She published short stories, and then a five-novel series, called “The Children of Violence.” The novels are about life in Colonial Africa. “The Golden Notebook” was published in 1962 and is considered her breakthrough novel. In the 1970s, she began writing science fiction including a series called “Canopus in Argos.” She then returned to contemporary literature in the 1980s. Lessing continued writing novels through 2008. Her last novel, “Alfred & Emily” is part memoir and part fiction, and focuses on her parents. She died November 17, 2013 at the age of 94.